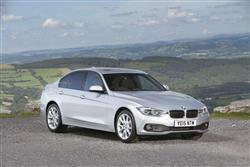 The much improved sixth generation BMW 3 Series makes frugal sense in 318d diesel form. Jonathan Crouch checks it out. Now bigger but markedly more efficient, BMW's improved MK6 3 Series offers a tempting business-orientated package in 318d form. With 150bhp, it packs a performance punch, yet can still return nearly 70mpg and put out 111g/km of CO2. Add to these figures the many other virtues of this standard-setting compact executive model and you've a car that'll be hard to overlook for middle-ranking managers.